MIKULSKI, Barbara Ann, a Senator and a Representative from Maryland; born in Baltimore, Md., July 20, 1936; graduated, Mount St. Agnes College 1958; received a graduate degree from the University of Maryland School of Social Work 1965; social worker in Baltimore; college professor; member, Baltimore City Council 1971-1976; unsuccessful Democratic candidate for the United States Senate in 1974; elected as a Democrat to the Ninety-fifth Congress; reelected to the four succeeding Congresses and served from January 3, 1977, to January 3, 1987; was not a candidate for reelection to the House of Representatives in 1986, but was elected as a Democrat to the United States Senate in 1986; reelected in 1992, 1998, 2004 and again in 2010, and served from January 3, 1987, to January 3, 2017; Democratic Conference secretary (1995-2005); chair, Committee on Appropriations (One Hundred Twelfth [December 20, 2012-January 3, 2013] and One Hundred Thirteenth Congresses); was not a candidate for reelection to the Senate in 2016. Papers: Senatorial papers. Closed pending processing. Papers. In 9 to 5, National Association of Working Women records, 1972-1986; and Candidates for public office campaign materials, 1966-1976. Mikulski, Barbara, with Marylouis Oates. Capitol Offense (novel). New York: Dutton, 1996. ___. Capitol Venture: A Novel. New York: Dutton, 1997. ___, et al. Nine and Counting: The Women of the Senate. New York: Perennial, 2001. "Barbara Mikulski," in Women in Congress, 1917-2006. Prepared under the direction of the Committee on House Administration by the Office of History & Preservation, U.S. House of Representatives. Washington, D.C.: Government Printing Office, 2006. U.S. Congress. 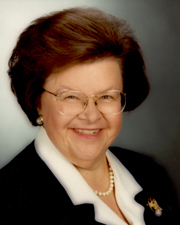 Tributes Delivered in Congress: Barbara A. Mikulski, United States Congresswoman, 1977-1987, United States Senator, 1987-. Washington: U.S. Government Printing Office, 2012.